»Garden»Order Your Author-Signed Book In Time For Christmas! Order Your Author-Signed Book In Time For Christmas! Posting this again this year and adding some updates! What child wouldn’t be excited to receive a book signed by the author? 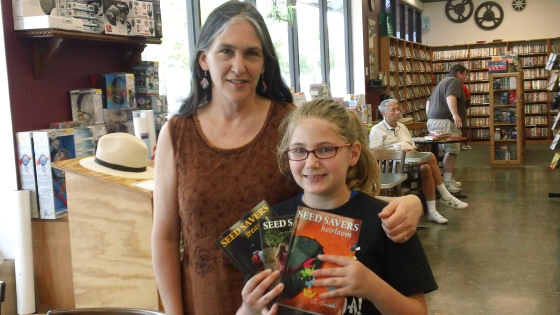 There’s still time to order any of the Seed Savers books directly from me, with a personal inscription for you or your child. Treasure, book one of the series, is sure to delight book lovers ages 8 -12, or older readers who enjoy middle grade books. Lily and Heirloom are slightly older in writing style, and still appropriate for kids. Read more about all three of the books here, or visit their Amazon pages to read more customer reviews. To order an inscribed book, contact me directly with this form or email me at authorssmith at gmail dot com. Don’t delay if you are ordering for Christmas!